Running out of disk space for the things that really matter to you, like your photos, videos, games, or work? It may be because both Windows® and the programs you use eat up more of your hard disk than they really should. 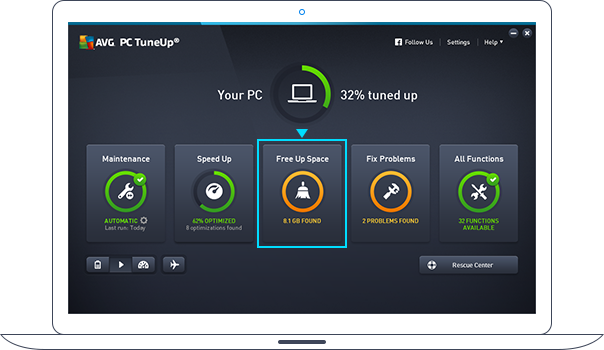 AVG TuneUp can help speed up your PC. Once there, click on the Free Up Space tile. Many programs clog up your machine by automatically storing temporary and old junk data deep in places you'd never know to look. 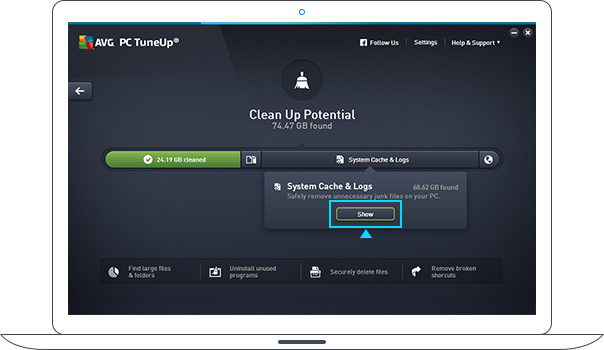 Thankfully, AVG PC TuneUp knows exactly where that data is hidden and finds it for you with a simple scan. Click on System Cache & Logs and then click on Show to view all the unwanted clutter. To free up that space, just click on the Clean button. Windows produces memory dumps containing relevant analytical information every time your PC crashes. Whenever a program crashes, Windows generates a report that contains information regarding the nature of the crash. Disk repair utilities (such as Microsoft’s very own Chkdsk) detect bad clusters and try to restore the damaged data. This recovery data is saved as new files on your hard disk. Unfortunately, in most cases, these files do not contain usable data since the original information can often not be restored. Just by their installation, programs leave behind a lot of temporary files that clog up your hard disk. 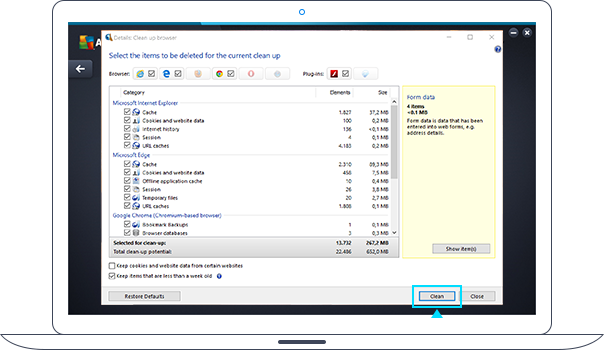 Disk Cleaner cleans up Microsoft Installer (MSI) leftovers safely and reliably. These are temporary files that are left on your disk by programs and Windows. This includes, for example, the font cache used by Windows Presentation Foundation (WPF) programs and the bitmap cache of the remote desktop application. Windows and 3rd-party programs often record logs of their operations, which can clog up your hard disk over time. Windows and various other programs create temporary files to cache their current operations. These files can contain personal information which might not get deleted once that operation is done. These are restore points that the operating system creates to revert back to previous states. They also include downloaded Windows updates that have already been installed. Temporary thumb files created and displayed by Windows-explorer. Many programs, including Windows, create lists of files you recently opened. While that’s convenient, it may also be a privacy risk. Disk Cleaner helps with cleaning this up. Whenever you browse the web, hidden leftover files get created that sometimes even your browsers can’t track. That’s where Browser Cleaner can help. Click on Browser data (globe icon). Check what you want to delete (read the pane on the right for more details) and click the Clean button! Your PC should have more free space for the things you love. Want more? Check out our Ultimate Guide to cleaning up your PC.